A half-dozen girls are pushing with all their might to roll a 400-pound bale of hay across the pasture at CORRAL. It’s obvious in her posture that one girl is less than thrilled about the effort. One Saturday a month, CORRAL Riding Academy invites the public to take a tour of the farm, see some horses, pitch in on some chores and support the nonprofit’s mission of empowering at-risk girls. For more information and to sign up, visit corralriding.org. Currey, who holds a master’s degree from Columbia University’s Teachers College, was deeply influenced by her experiences as a teacher with Teach for America, where she saw the effects of poverty on children’s success. 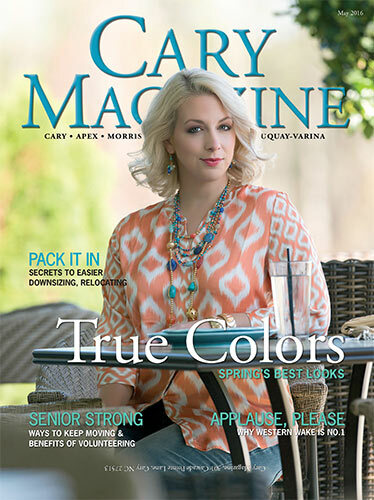 She founded CORRAL in 2008. Girls first attend Join the Herd, an eight-week equine therapy program teaching basic relationship skills; those demonstrating a commitment to change are invited to join the long-term core intervention program. Joy Currey founded CORRAL in 2008, after seeing the effects of poverty on children’s success firsthand, in her previous work with Teach for America. 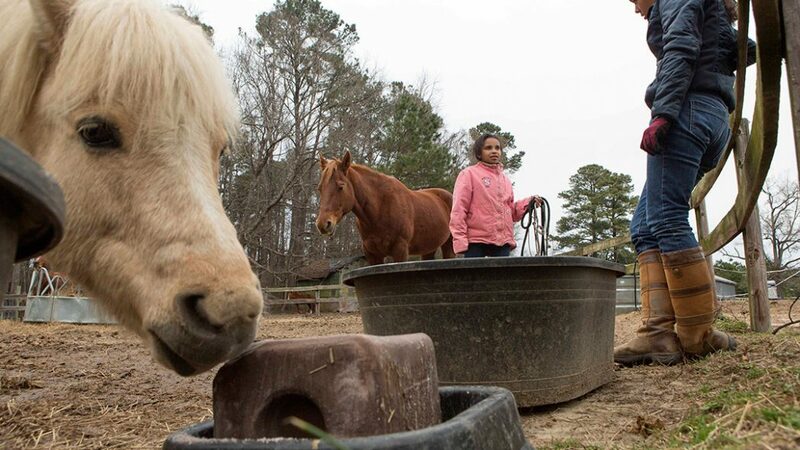 CORRAL’s experienced staff of eight offers academic tutoring, mentoring and equine-assisted psychotherapy by pairing girls with rescued horses, helping girls overcome past trauma or self-destructive behaviors to blossom. Hundreds of volunteers help each year. Back to the new girl: To protect her privacy, let’s call her Susan. Her next challenge is to engage with her horse, River. He is ignoring her, walking away every time she approaches. Susan is hesitant and seemingly wants to give up. Counseling her to “develop a game plan” are CORRAL therapists. As twilight settles on the pasture, Susan and River finally connect. He stands still, and turns to face her. She pets him a while, then carefully slips the halter over his head. Volunteer Fran Hovey helps a participant with homework. To date, every CORRAL grad has gone on to college. Currey explains the science behind it: “Horses are herd animals; they rely on each other for safety, and that means they need good family structures. If you are not a healthy, contributing member of the family, they won’t let you be part of it. “They’re also flight animals. They have 360-degree sight, and can sense the environment. They can tell how fast your heart rate is, and your breathing. Too fast and they think you’re a predator, you are not safe, and they won’t work with you,” she said. “Mary,” a high school senior in this year’s CORRAL class, will graduate this month and head to college in the fall. To prepare for this new experience, staff recently required Mary to step out of her comfort zone and work with a different horse. To serve more girls in future, founder Joy Currey plans to launch a satellite CORRAL program in fall 2017, on another Triangle farm. “CORRAL has prepared me in different ways. A year ago I didn’t know my skills, and now I do,” Mary said. “I feel ready, and excited. CORRAL has guided me and given me support and what we call tools, to grow up. The challenge will be to make new friends and build a new support system. In the ring with her spunky Arabian mare Giselle, who was pregnant and malnourished when rescued, Mary rides “on the buckle,” meaning keeping the reins loose. Overcoming the urge to control the horse with a tight rein indicates a healthy connection created through hard work, Currey notes. Tonight, Giselle will even jump under Mary’s direction. CORRAL is still celebrating the purchase of its 10-acre site on Kildaire Farm Road, accomplished via an intense fundraising campaign in late 2015 that’s been dubbed the Million Dollar Miracle. The land was previously leased from Currey’s dad, who was selling his 50-acre farm to retire. Nine hundred donors contributed amounts from $10 to $200,000 to reach the $1 million goal. To serve more girls in future, Currey plans to launch a satellite program of CORRAL in fall 2017, on another Triangle farm. So what happened with Susan? At full nightfall, she and River are walking side by side in the corral, under the lights. Currey smiles.